Ryan Gosling and Emma Stone star in a throwback musical that's gloriously nostalgic yet entirely fresh. With that single piece of dialogue, writer/director Damien Chazelle (“Whiplash”) lays out his own filmmaking challenge then proceeds to shatter it, creating a throwback musical that’s gloriously nostalgic yet entirely fresh, resurrecting a staple of cinema’s Golden Age for a new generation. It’s not that “La La Land” revived the genre itself; musicals resurged at the turn of the millennium with animated gems (“Beauty and the Beast,” “Frozen”), live-action flicks (“Moulin Rouge,” “Chicago”), Broadway hits (“Rent,” “Wicked,” “Hamilton”) and TV specials (“Grease Live,” “Hairspray Live”). No, what “La La Land” has done is revive a classic style of musical, where vibrant dances gladly give way to avant-garde dream ballets, reviving a lost art-form defined in Hollywood by Stanley Donen’s “Singin’ in the Rain” (1952) and overseas in Jacques Demy’s “The Umbrellas of Cherbourg” (1964). Present-day Los Angeles is the perfect setting for this Technicolor romance between two young dreamers: Mia (Emma Stone), an aspiring actress rejected from countless auditions while hoping for her big break, and Sebastian (Ryan Gosling), a struggling jazz pianist hoping to open his own jazz club. Can both fulfill their dreams, or is love enough? And what if they had to choose between the two? For Stone and Gosling, it’s been a 15-year climb from fan favorites to critical darlings: “Remember the Titans” (2000), “The Notebook” (2004), “Half Nelson” (2006), “Superbad” (2007), “Lars and The Real Girl” (2007), “Zombieland” (2009), “Blue Valentine” (2010), “Easy A” (2010), “Drive” (2011), “The Help” (2011), “The Ides of March” (2011), “Magic in the Moonlight” (2012), “The Place Beyond the Pines” (2012), “The Amazing Spider-Man” (2012), “Birdman” (2014) and “The Big Short” (2015). However, if you saw them steam up the screen in “Crazy, Stupid, Love” (2011) or “Gangster Squad” (2013), you know Stone and Gosling are most adorable together. 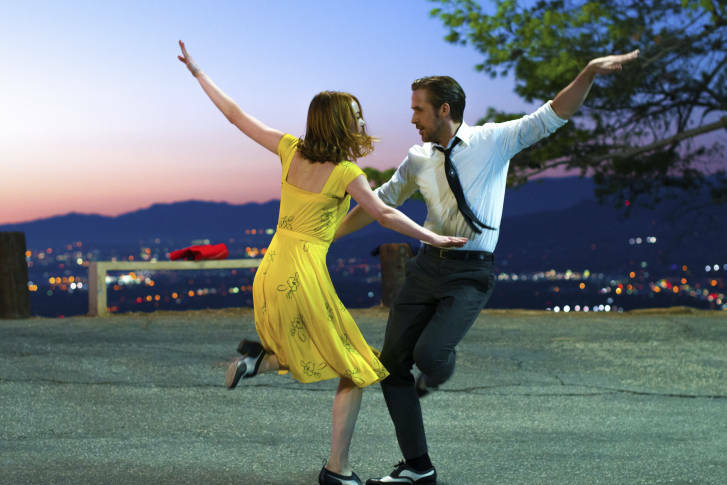 While their on-screen chemistry is no shock in “La La Land,” you’ll be pleasantly surprised how each rises to the challenge of song and dance. Sure, they’re no Astaire-Rogers, but each commits fully to the triple-threat demands. Rather than stellar dancers trying to act, we watch stellar actors learn to dance — and it’s charming as hell. While many are predicting Natalie Portman (“Jackie”) to win the Best Actress Oscar, Stone could easily score the upset, showing a much wider range of comedy, drama and musicality. She’s equally convincing in moments of slapstick humor (coffee down the shirt), self-deprecating banter (It’s “Dangerous Minds” meets “The O.C.”) and teary self-doubt (“Maybe I’m not good enough”). If you don’t choke up during her rendition of “Audition (The Fools Who Dream),” you likely have no soul. Likewise, Gosling plays to both sides of his fan base, as Nicholas Sparks fans break out their hankies and Nicolas Winding Refn diehards dig the artistry. Gosling sells deadpan quips (“Samba, tapas, pick one”), spits James Dean references (“I got the bullets!”) and lends an odd charm to his everyman crooning. All the while, Chazelle uses long takes without hand doubles to show it’s actually Gosling playing the piano, building to a giant lump in our throats with subtle glances above ivory keys. Rounding out the cast is Oscar winner John Legend (“Glory” from “Selma”) as bandleader antagonist Keith; Rosemarie DeWitt (“Mad Men”) as Gosling’s sarcastic sister urging him to get his life together; and J.K. Simmons (“Juno”) as a stringent bar owner. It’s a delicious cameo for Simmons, who gladly reunites with Chazelle after winning his “Whiplash” Oscar in a bit of hilariously ironic casting. He no longer grades the “rushing and dragging” of musical flourishes; he wants Gosling to play the setlist. “La La Land” actually mirrors “Whiplash” stylistically with the same editor Tom Cross, who cuts the images of cinematographer Linus Sandgren (“American Hustle”) into staccato, three-beat salvos (stove burner, coffee cup, record player). This creates a visual tempo to the hypnotic music of Justin Hurwitz (“Whiplash”) and unforgettable lyrics by Benj Pasek and Justin Paul (“Dear Evan Hansen”). The giant opening number “Another Day of Sun” is a six-minute single take (with two illusion masks) along the shutdown EZ Pass ramp connecting L.A.’s 105 and 110 freeways. Cinephiles will recall “8 1/2” (1963) or “Falling Down” (1993) as the camera swoops over the traffic gridlock and diegetic sound emits from the car radios. Suddenly, 100 dancers climb out to snap-dance, Jerome Robbins style, flipping, spinning, even bicycling across the car tops. Ahh, if only all traffic jams were this joyous. After the eye-popping opening, the second number, “Someone in the Crowd,” boasts another long-take of Stone and her roommates in their starving-artist apartment, where giant images of Ingrid Bergman adorn the walls and mirrors show their audition-ready reflections. After a superimposed barrage of champagne pours and flashing marquees, we arrive at a swanky pool party, where the camera tiptoes outside under surrealist snow to plunge underwater (foreshadowing Mia’s aunt diving into the freezing Seine) before emerging to the surface to spin in dizzying bliss capped by fireworks. Such carefully constructed chaos is awe-inspiring in back-to-back numbers, but it would become tiresome if attempted a third straight time. So, the film slows things down for the next few numbers. The charming duet “A Lovely Night” finds Gosling and Stone gazing out at a purple sunset horizon from atop the Hollywood Hills, where Gosling does his best Gene Kelly pose on a lamppost before adorably soft-shoeing with Stone, gliding across the pavement and tap dancing atop a park bench. Like many musicals’ signature songs, “City of Stars” becomes a musical bed for much of the film, as Hurwitz returns to the familiar piano tune over and over again with entrancing, even haunting notes. Sometimes it’s non-diegetic on the soundtrack; other times it’s diegetic as Gosling plays the song at his apartment piano, joining Stone for a seated duet in the glow of neon green light from the window. While Chazelle says the light recalls the Emerald City in “The Wizard of Oz” (1939) and the green mist in Francis Ford Coppola’s “Dracula” (1992), the silhouetted bodies against neon green backlight unmistakably recalls “Vertigo” (1958). Hitchcock’s tragedy of lost love is a fitting backdrop for the pivotal argument in “La La Land,” a textbook screenwriting example of a nice dinner escalating into two lovers talking past each other, then saying things they can’t take back, buttoned by a fire alarm. It’s the perfect precursor to the bittersweet finale, a dazzling dream ballet recalling the 17-minute sequences in Vincente Minnelli’s “An American in Paris” (1951) and Stanley Donen’s “Singin’ in the Rain” (1952). In “La La Land,” we get a collection of expressionistic colors, superimposed images, mannequin challenges and miniature airplanes moving across spinning globes. Of course, it’s all too good to be true, as our lovers watch tearjerking 16-mm footage of “what might have been” before the gut-wrenching wrap-around finale recalling Jacques Demy’s “The Umbrellas of Cherbourg” (1964). And yet, this film projector heartbreak is cathartic because it balances perfectly against the film projector of their first date, as Stone stands in the light of a retro screening of “Rebel Without a Cause” (1955) before recreating the James Dean-Natalie Wood love affair with a visit to Griffith Observatory. Defying gravity as they rise up into the planetarium, our lovers waltz among the stars before gently returning to earth for the most magical first kiss in movies, punctuated with an iris. It’s here that we realize “La La Land” isn’t just a love letter to Hollywood but also to the city of Los Angeles, which is often critiqued as out-of-touch from reality. Even the term “la la land” is often a pejorative for the pipe dreams of starry-eyed romantics. But while “Chinatown” (1974) exposed the city for rampant corruption leading to Faye Dunaway’s lifeless head honking a chilling steering wheel, Chazelle has reclaimed L.A. as a magical place, revamping the wheel into Gosling’s humorous honk. The movie will no doubt have its critics. They’ll call the footwork by non-dancers “amateur,” but how quickly they forget Debbie Reynolds hadn’t danced a step before “Singin’ in the Rain.” They may even call the lavish production “less important” than the other socially-themed films of a politically-divisive 2016, but how quickly they forget Busby Berkeley’s catharsis during the Great Depression. Who says they don’t make movies like this anymore? Want more on “La La Land?” Check out my interviews with Emma Stone and Damien Chazelle here.